The photographer who's coming to my birth is offering a free Bliss family package. If you live in the greater Lafayette or Indianapolis, IN area, you're welcome to enter the giveaway! 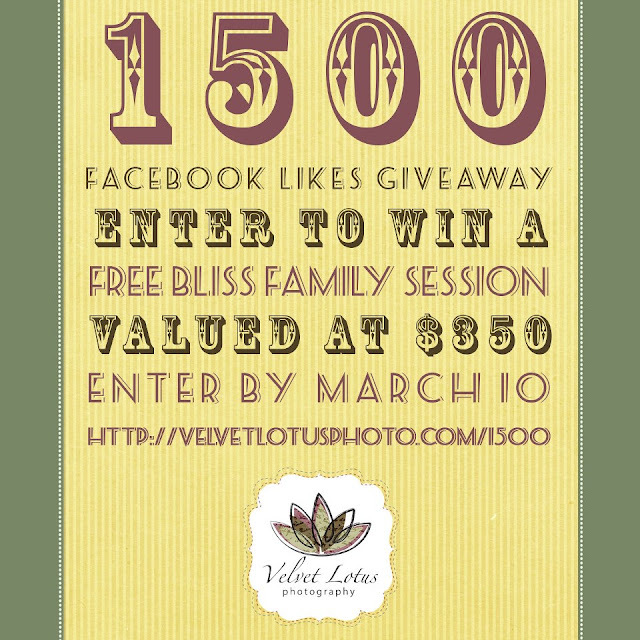 Thank you so much for supporting Velvet Lotus Photography on Facebook! We've reached a huge milestone at 1500 likes. So, as a thank you, we are giving away one free Bliss family session valued at $350. We will randomly pick a winner and announce it on Facebook on or after Sunday, March 10th. You don't have to like our page, but you'll be a lot cooler if you do. Digital album download with 4x6 resized images. Print release for 4x6 prints of all images. Watermarked web formatted images for use on Facebook or E-mail. 20% off print orders for 30 days (minimum $50). Up to ninety (90) minute photography session. Up to two (2) locations (time includes travel between locations). Up to thirty (30) digital images. A $25 per person charge applies for groups larger than seven (7) people. You must be 18 years or older to win. Session must be used before July 1st, 2013. Travel outside the Greater Lafayette, Indiana area not included. All travel fees must be paid in advance. Session is transferable as a gift to another person. Session has no cash value and may not be redeemed for such. Session value may not be applied towards previously booked sessions. Session value may not be applied towards weddings, senior sessions, newborns, births, first year, boudoir or any other packages. Session value may not be redeemed as print credit.